Howdy, from Cincinnati, Ohio! Bundle up, friends, because this week our Guest Instagram series takes you to Northside Farmers Market, a place that doesn’t let something trivial like a midwestern winter freeze its love for the local food scene. Market Manager, Ana Bird tells us how Northside FM warms the cold, Cincinnati months with fresh, local food and market fun! 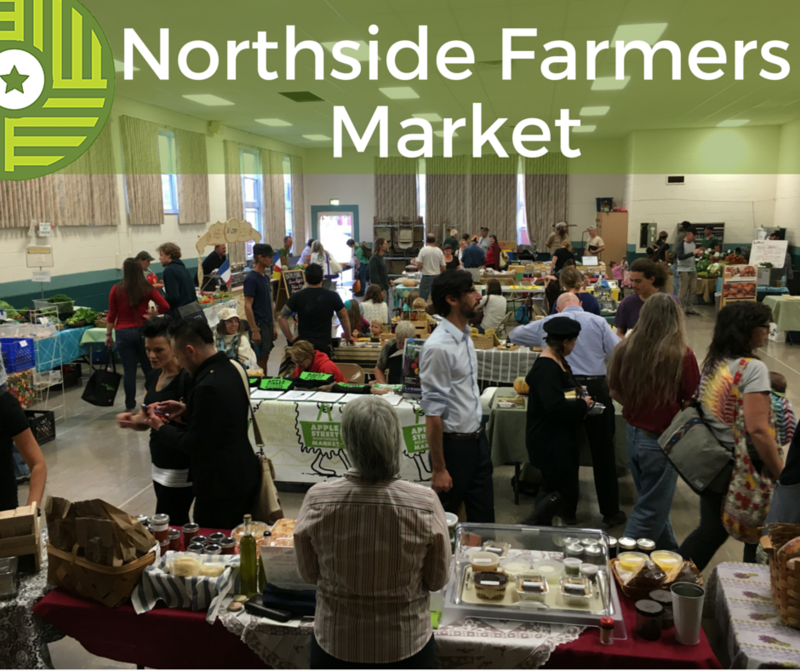 Farmers Market Coalition: Tell us all about Northside Farmers Market. Ana Bird: Northside Farmers Market began very modestly and unassumingly in 2000, largely through the efforts of two Northside residents, Robin Henderson and Keebler Holly. They worked to beautify a portion of a centrally located parking lot within Northside’s business district facing Hamilton Avenue, the neighborhood’s main thoroughfare. Robin and Keebler sought and received the endorsement and support of both the Northside Community Council and Business Association, and reached out to growers. Approximately 10 vendors were part of the market’s first season. In 2007 the market hired its first part-time manager, and since then has continued to grow. The market was one of the first in Cincinnati to become a year round market in 2009, and moved into a larger park in the neighborhood to accommodate further growth. Today NFM has 28 vendors year round, and additional vendors in the summer, 3 part time staff members and an advisory board. All products are required to come from within 70 miles of Northside. Between May and October the market meets every Wednesday in a city park, and in the late fall moves inside to the auditorium of a church. Many of our vendors have been with us for years, some since 2000 when the market began. As a result, our market has a friendly vibe! Many of our shoppers have good relationships with our vendors, others do the majority their grocery shopping with us. It’s definitely a place where neighbors linger over a coffee. FMC: What makes Northside Farmers Market an important community venue for the residents of Cincinnati? AB: For the past few years, we’ve been lucky enough to support a local grant which has allowed us to host a petting zoo and other kids programming in the summer. Every week year round, we have music and free kids activities. We find these programs are very popular with our locals and gives them the perfect excuse to get outside, be active and socialize. In the last year, thanks to a USDA grant, we’ve developed $3.00 Kids Cooking Classes, Adult Cooking Classes, cooking demos, and free nutrition classes. In 2013 the neighborhood lost it’s grocery store, and many of our residents are low income. We responded by accepting SNAP and WIC at the market, and participate in a matching program called Produce Perks, and so we are able to provide a $10 match for SNAP customers every week at the market. We also run our “Another For A Neighbor” donation program, which allows the community to both support local farmers and help their neighbors in need and began a Frequent Shopper Rewards program this summer that gives three lucky winners each month a gift certificate to a local hot spot. FMC: How has social media worked to promote Northside FM? AB: We have found that Facebook is one of the best ways for getting the word out about our market, and the place where customers engage with us the most. We are also working to build our Twitter and Instagram platforms. We’ve begun experimenting with Periscope, which we feel is an exciting way to connect with our community and show folks what’s available at the market. The market also makes sure to use neighborhood social media platforms, and sends out a weekly newsletter. We constantly check out what other markets are posting and have definitely been inspired by others! FMC: What would you like our Instagram followers to learn from your market? AB: We are looking forward to showing your followers what a winter market can look like in the Midwest. We have many wonderful growers who are working to make fresh food available all year long. We also want to share the sense of community that comes from merging education, free events, food, and neighbors in one place. Follow FMC on Instagram to find out how Northside FM braves the winter!